This post was written by Sandy Harmsen of the Workforce Investment Board for CMTA's Champions program. The San Bernardino County Workforce Investment Board received a grant from the California Workforce Investment Board to help 30 young adults, between 18 and 24 years old, earn certifications in courses designed to introduce a new generation of workers to the manufacturing industry. The courses can be taken at three locations: Chaffey College, San Bernardino Valley College, and Technical Employment Training, a non-profit organization offering training in the manufacturing trades. In addition to providing nationally recognized industry certification, the program also offers the targeted career guidance and mentorship that the participants need to advance their career prospects in a meaningful way. George Loya was sitting in an electrical theory class last spring at Chaffey College when his instructor announced a new training program for youth to learn how to maintain equipment in a manufacturing plant. “I signed up first thing,’’ said Loya, 23, who currently works at a distribution center in San Bernardino. “I wanted to better myself; I have a four-year-old daughter.’’ Loya went on to complete the training at Chaffey College and received the industry certification. Program administrators are now helping him advance to the next step toward securing a job. He has passed an initial set of assessments to qualify for an entry level temporary position at California Steel Industries in Fontana. If he is invited to join California Steel, Loya could potentially go on to become a level “A” expert electrician earning more than $80,000 per year. The youth training program relies on a recruitment effort shared by the County of San Bernardino and the community colleges where the training occurs, said Deborah Smith, a community training coordinator at Chaffey College. In partnership with the training providers, staff of the Workforce Development Department promoted the program at America’s Job Centers of California, which have locations in the cities of San Bernardino, Victorville and Rancho Cucamonga. They also recruited students from Chino Valley Unified School District and from other local youth service providers. This comprehensive approach was designed to identify students who may not have performed well in a traditional school setting, but who have the ability to master the technical skills to become a highly-trained electrician or mechanic in the manufacturing trade. 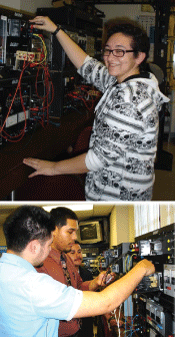 Jacklyn Ortiz is another student who recently completed the program at Chaffey College. Ortiz is a high school graduate with a criminal record. She passed every program test on the first try and was one of the best students in class, said Smith. “Jacklyn has a mechanical aptitude and is very sharp.’’ The program is intended to help individuals like Ortiz move forward and has connected her to a staffing agency that will work with former inmates. This program is a great example of how the combination of training and mentorship advances the careers of our youth. Sandy Harmsen is executive director of the Workforce Investment Board and director of the County of San Bernardino Workforce Development Department.